DYMOS® is a customizable software system designed for dispatcher control and operation optimization of district heating systems. The system can be used for heat production and energy consumption predictions, for optimizing supply-water temperature including heat accumulation and need of additional heat sources operation. The subject of the delivery covers the integration in the existing control system. Training, maintenance and service is included. 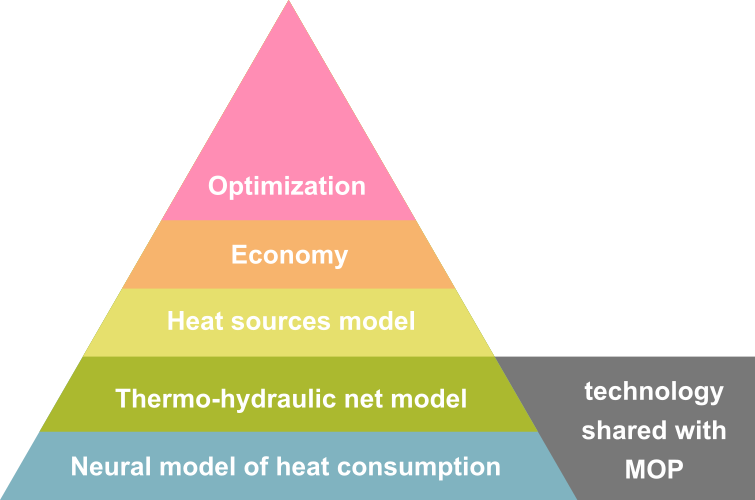 The software is based on a complex simulation model of heat production, distribution and consumption. The software uses MOP technology for the thermo-hydraulic network calculations and the neural model of heat consumption, but unlike MOP, it is adapted for specific optimization tasks requested by a particular customer. DYMOS shares with MOP also the main user interface (that can use geographic display of the network, display pressure diagrams, pump operation diagrams, WMS on-line background maps, etc.) and extension modules GISimport, SQLexport, etc. Control of hot-water output temperature allows to utilize controlled heat accumulation. Various detailed models of boilers, turbines, and other source devices make it possible to calculate the available and forced electrical power. The layer of economics allows, based on the prices of commodities sold and purchased, to count sales and costs within the period under review and, on this basis, it is possible to compare the economic viability of the individual operating options. The DYMOS system also includes selected optimization algorithms, such as optimal redistribution of the power of the individual sources in the system while meeting defined boundary conditions. The system enables its users to operate in a predictive, simulation and analytical mode. The predictive mode serves for the system behaviour prediction in near future, while the analytical system serves for the analysis of different operational situations. The simulation mode provides for modeling of any historical or future operational version. This mode is primarily used in operation planning to predict heat supply and electricity production for one or several days ahead. It can be used in the process of short-term trading of electricity, or for subsequent checks and adherence to agreed deliveries. For larger hot-water systems, controlled heat accumulation can be utilized by changing the hot-water output temperature. Simultaneous display of measured and model values, where the graphs display the intersection of predicted and measured values, allows you to track the quality of the prediction, or to respond to new situations. The so-called continuous predictor allows predictions to be updated after some time. The result is a prediction shifted for the current moment, but with respect to the previous operation setting. This mode makes it easy to use measured historical operating values from a measurement database to model the former system state. Subsequently, the impact of other hypothetical changes of management on the historical operation of the system can be analyzed. This mode makes it possible to create and study different operating variants for any outdoor temperature without any connection to the actual state of the system. This mode is designed to build long-term production plans (month, year, ...) and to elaborate conceptual materials for long-term system development and optimization. Copyright 2016-2018 - Template customization by ORTEP, s.r.o.